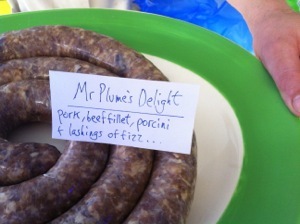 A few years ago I visited De-Lish in Wells-Next-The-Sea and Jules, a sausage genius, created the Mr Plume’s delight! Here Jules shares the recipe so you can have a go at making this sumptuous sausage at home! Here is the receipt for Mr Plume’s Delight. It is based on / inspired by saucisses au champagne which you can find in the hippesly-coxe sausage book, and also in predika if I remember correctly. I first heard of it from an ancient mariner during my time in wells-next-the-sea. A wonderful old boy called Ray who was a polymath, gourmand and bursting with stories. You take a freshly killed pig, mince the lot of it, soak it with the best champagne from your cellar, and remortgage your chateau as you clear out your truffle safe. Predika says you should deep fry them. But that is an abuse we shall leave to the Scottish. My take on it was more of a Po’ Boy reproduction. Most of my sosijs were made in continuous lengths. I was not a butcher or supermarket production line, and didn’t want to resemble either. I wanted you the customer to tell me how much you wanted, not the other way round. Of course there was exceptions: stouties, dead men’s fingers, hallowieners, venison haggies, and breakfast sausage to name a few . . . Each for their own reason . . . So, get yourself some quality pork mince (none of that rubbish lean stuff or value muck). between 0.1 – 0.25% ground black pepper. Thoroughly mix the lot up and stuff into to hog or chip skins. Let it bloom for a day ideally. Cook with respect and eat with glee. NB the fillet and posh shrooms are there to reflect the colour and taste and extravagance of the truffle.